Posing with one of two new pianos used for music therapy at the Fort McMurray Recovery Centre are, from left: Thomas Kannumkulabil, manager, Addiction & Mental Health; Margaret Butts, counselling supervisor; Lorna Ash, director of development, Northern Lights Health Foundation; Jessica Lipton, foundation events manager; Cindy Amerongen, foundation executive director; Len Savoy, Suncor); and Mike Allen, Campbell’s Music. 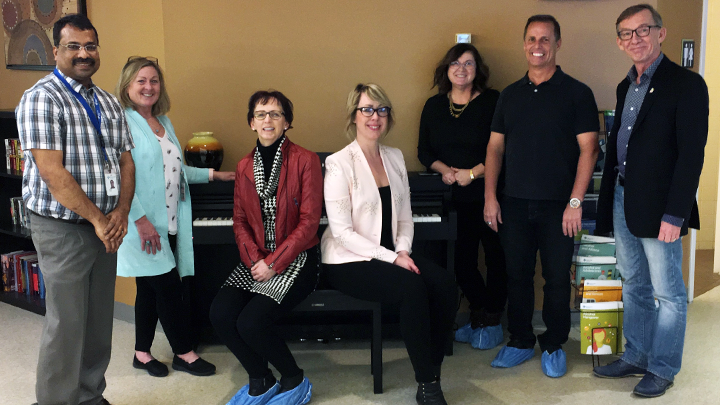 FORT McMURRAY — Tickling the ivories is now an option when it comes to musical therapy at the Fort McMurray Recovery Centre, thanks to two new pianos made possible by a generous donation from the Suncor Energy Foundation to the Northern Lights Health Foundation (NLHF). Clients can now pull up a bench to enjoy the digital pianos as they access programs and services at the Alberta Health Services (AHS) facility. They’re the latest instruments to be added to the Recovery Centre’s new Music Therapy Program, which also offers a guitar, two maracas and a drum. The pianos, which arrived in late December, have been set up in the main lobby. Plans for the pianos include the introduction of structured lessons for clients, and the creation of opportunities for local musicians to perform at the facility.